Home » facebook » social media » technology » The key announcements from Facebook's F8: what's coming. 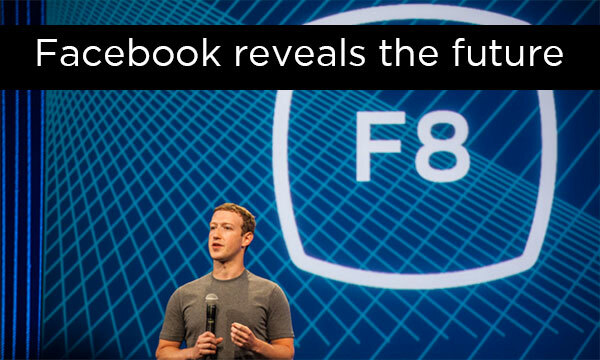 The key announcements from Facebook's F8: what's coming. Mark Zuckerberg, Facebook CEO, is all excited about live video. And Messenger. And how Facebook plans to move far beyond its role as a social media network. Facebook's 10-year forward plan is to “Give everyone the power to share anything with anyone.” The aim is to launch new virtual reality projects, provide Internet access around the globe using drones and create artificial-intelligence "bots" that can answer to one's every digital request. Wow! Live Video is Mark Zuckerberg's obsession these days. Seeing more and more celebrities as well as brands take on quickly to Facebook Live, there seems to be no stopping now. Time magazine says "(Zuckerberg sees) a chance to capture the kind of spontaneous, off-the-cuff video that has grown popular on Snapchat. To that end, the company is opening up its Live broadcasting feature so that people can live stream from all sorts of devices, not just smartphones. During his speech, Zuckerberg demonstrated the move by having a drone take off and shoot live footage of the F8 audience." Facebook will also roll out a video rights manager – pitted against "freebooting" – the practice of stealing a YouTube video and posting it on Facebook without permission. Facebook's new rights management system will let creators upload reference videos so that duplicates are automatically flagged and removed much faster. Facebook announced tools to help developers build bots that hold automated conversations with people within the popular chat app Messenger. The early version bots handle basic functions, from delivering news to offering a weather forecast to acting as a shopping assistant. Facebook's plan is to improve on this development by offering advanced coding tools known as the Bot Engine – which will help handle more complex tasks. Facebook is planning to roll out a design and software code for a 360-degree camera system. This will help generate content for the Facebook-owned Oculus VR virtual reality firm. Special stitching software allows multiple cameras to generate stereoscopic 360-degree panoramas. Interestingly, Facebook is hoping the open-source nature of the project will encourage others to build their own rigs. This could also bolster the Live Video more. Imagine what this does for events! Facebook is betting that virtual reality will enable intimate social interactions over long physical distances. Facebook actually demoed this plan, where executives equipped with Oculus headsets explored various 360° photos of London and manipulated virtual objects in that environment – including yes, a selfie stick! This year, Facebook's F8 conference was really all about the next ten years. And it wasn't just blueprints and plans. It was almost reality. During his speech, Zuckerberg demonstrated the move by having a drone take off and shoot live footage of the F8 audience! Zuckerberg showed off “bots” that will serve as robotic "customer service reps" for news, weather and retail companies, and showed how he wants to use virtual reality to put grandparents inside baby videos. He also took a dig at Donald Trump. The Guardian summarized the conference, saying "Zuckerberg’s ambitions illustrate how technology companies are no longer content with getting people to visit their website or download their app; their future depends on being omnipresent in people’s lives.". He also took a dig at Donald Trump. So true. And that's not rocketsurgery. See post on Live Video: Is your brand ready for it? Facebook is trying to become more than a social platform. That is so clear. That it doesn't become a controlling presence in our daily lives is something we should all be careful about. These plans seem a bit too ambitious. There were a lot of reports on Facebook's f8 summit. This year was one of their most promising. This is a good report that touches the main points. Thank you.